Being the grammar nerd that I am, few things make me madder than seeing a missing Oxford comma. Most people probably don’t understand this frustration, and just ask, “Why are Oxford commas important?” It may not be immediately obvious, but an Oxford comma can make a huge difference in how a sentence is read. And, unfortunately, not all well-known style guides advocate for the Oxford comma. For example, in Associated Press (AP) style, it’s best practice NOT to include Oxford commas in order to save characters, and thus space, on the page. So, what is the contentious Oxford comma, and why is it important? The Oxford comma is the final comma before the conjunction (e.g., and, or) in a series. 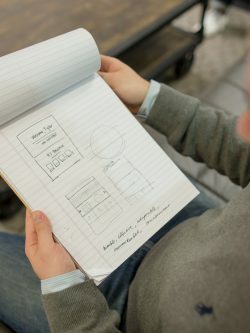 For example, when I use an Oxford comma, my sentence might read, “Kelly loves Twitter, yoga, and blogging.” Without an Oxford comma, that sentence would read, “Kelly loves Twitter, yoga and blogging.” But, at some point, everyone writes at least one sentence without that final comma, so why is it a big deal? It’s important to include Oxford commas in your writing because, in English, we also use what are called “commas of direct address” to separate what we’re saying from the person/object we’re addressing. That’s why it’s appropriate to write, “I love you, Mom,” instead of “I love you Mom.” Your mom is the person you’re addressing; you’re saying “I love you” to her, so the two need to be separated. How does this relate to the Oxford comma? When you have a series of three items, and you don’t include an Oxford comma, the items after the first comma could be read as the recipients or addressees of the earlier text in the sentence. A sentence like this might read, “I laughed at Michael, Janet and Bob.” In this sentence, without an Oxford comma, you’re telling Janet and Bob that you laughed at Michael. If you laughed at all three of them, you need to add an Oxford comma. 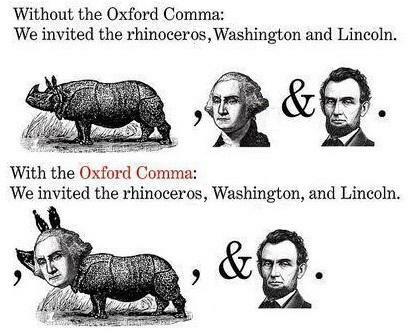 Likewise, there’s a popular meme that states, “We invited the rhinoceros, Washington and Lincoln.” This is an instance of how adding in a final comma completely changes the meaning of the sentence. Without it, you’re addressing the presidents, Washington and Lincoln, and letting them know that you invited a rhino to your party; with the additional comma, you either invited all three of them, or the rhino’s name is Washington. Still unclear on this point? If so, check out this TED-Ed talk. So, as you can see… it’s best if you use the Oxford comma. It helps clarify what you mean when you’re writing. And if you’re still not convinced, check out these memes before you decide you’re truly against the Oxford comma. Okay, the video and memes are great, but why are Oxford commas important in the real world? I’m glad you asked. Omitting Oxford commas in professional documents can have serious consequences. Some months ago, an appeals court in Maine made its decision on such an omission. Some dairy drivers from Oakhurst Dairy said they were owed overtime pay by their employer because a state law regarding what activities were exempt from receiving overtime pay was ambiguous. The dairy drivers argued that because one clause of the law was missing an Oxford comma, it was unclear which tasks were not eligible for overtime pay. The clause describing which activities were NOT eligible for overtime read as follows. Essentially, because there is no Oxford comma after the phrase “packing for shipment,” packing items for shipment or distributing them were not correctly identified as being two distinct activities that were both ineligible for overtime pay. The way the phrase is worded, it’s possible that “packing for” is applied to the rest of the phrase. If that’s the case, “packing for distribution” is not eligible for overtime pay but distributing produce, meat/fish products, and perishable foods would be. Since the drivers from Oakhurst Dairy were distributing the product, they felt they were entitled to receive overtime. When the circuit judges of the appeals court heard the case, they ruled in favor of the plaintiff (the dairy drivers) because they also thought this clause in the law was ambiguous. In short, Oakhurst Dairy was required to pay its employees overtime after the fact because a state law was missing an Oxford comma. So, yes, adding an Oxford comma won’t just appease grammar aficionados like me, but it could also protect you (or your clients) legally by eliminating any potential ambiguities. In short, you’ll come across much more savvy and professional if you’re including Oxford commas in your documents, whether or not they’re legally binding. Want some help making sure that all your commas are in the ‘write’ place? If so, contact us today to learn how we can help you with your content marketing.